Eric Park's brand-spankin'-new Black Hogg in Silver Lake is bound to be one of the sleeper hits of the year. Despite debuting just recently on March 6th, the place is already packed nightly with patrons eager to try the Chef's brand of rustic, robust, Animal-y cuisine. About the Chef: Though Chef Park grew up in Los Angeles and even attended UCLA, he's a relative unknown, a dark horse in the Los Angeles restaurant scene. He started out owning and operating a local sandwich shop (a Togo's, in fact), but after 10 years, decided to take his cookery to the next level. In pursuit of that goal, he sold the business, moved to New York, and enrolled at the French Culinary Institute (alma mater to chefs such as Dan Barber, David Chang, Wylie Dufresne, Bobby Flay, and Joshua Skenes). While there, he won the school's prestigious "menu project" competition, wherein students spend half a year working on a tasting menu, with a winner crowned at commencement. 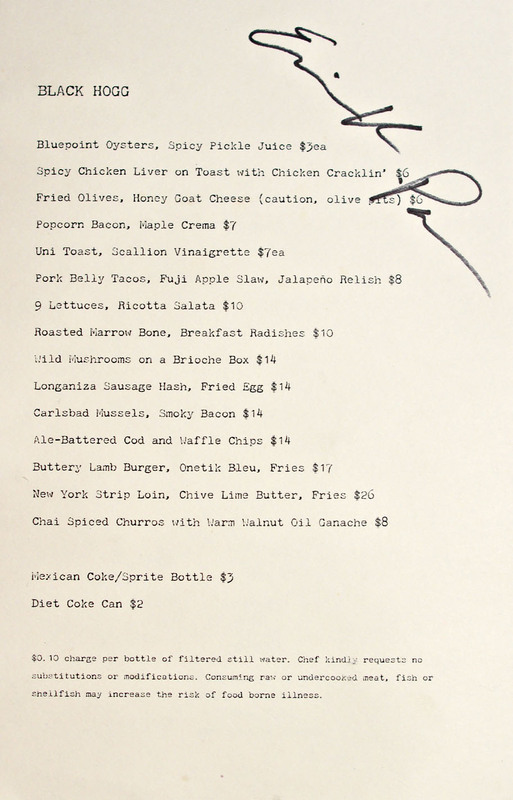 In addition, Park externed at the vaunted Eleven Madison Park, under celebrated chef Daniel Humm. This was followed up by a stint at April Bloomfield's seminal gastropub Spotted Pig, where Park was really able to learn the intricacies of running a kitchen, as well as define and refine his own cooking style. Park thus returned to LA with the goal of opening up his own space, using the funds that he had saved from running the sandwich shop for a decade. In June last year, he fell in love with a location in Silverlake, but the deal ultimately fell through. He ended up renting kitchen space from David Sutton, who had opened up David Catering earlier in March. 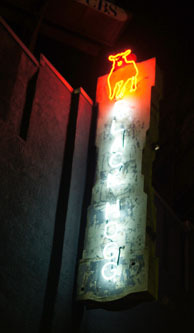 However, Park eventually bought the space outright from Sutton (who still uses a small alcove in the kitchen), and, together with partner Jonathan Kim, began working on Black Hogg in late 2011. A note on the name: Park originally wanted to name the restaurant "Black Pig" as a tribute to his favorite animal, the Kurobuta (or Berkshire) pig. However, there were a number of restaurants already laying claim to that name, so that was a non-starter. The alternative, "Black Hog," was also taken, so Park decided to name his place "Black Hogg" instead. He later discovered that a "hogg" actually refers to a young sheep (older than a lamb though), and liked the double meaning. The name "Black Hogg" is also a nod to the idea of a black sheep, which Park likens himself to as an outsider trying to open his first real restaurant. Ambience: Hipster. That's how Yelp describes the environment here. Really though, they're not far off from the mark (this is Silver Lake, after all). The restaurant was designed by Brendan Ravenhill (who also penned Osteria La Buca), and features a light, loft-y character. Some might call the room sparse, but a collage of mirrors backing the bar adds some visual interest to the space. Chef Park describes Black Hogg's menu as food that he loves to eat, but judging by how this place is doing, it's food that others love to eat as well. As for the booze, the restaurant is working on acquiring a license, but for now, it's strictly a BYOB, no corkage affair. I do really hope that Park gets a good beer list going here though, as I think beer would pair beautifully with the food. Click for a larger version. We took full advantage of the BYOB policy with our quartet of beers. 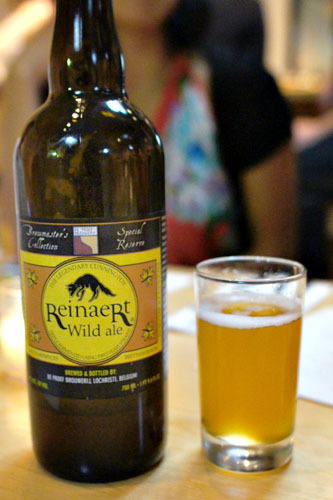 First up was the De Proef Reinaert Flemish Wild Ale, a bright, bracing, bubbly Belgian brew with a good mix of fruity flavors and a yeasty, sour funk. 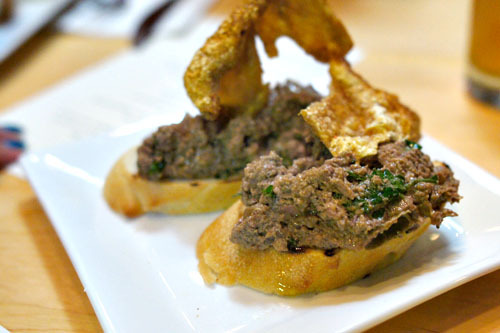 Park himself is a fan of the chicken liver at Animal and Mozza, but I think his version outshines them both. 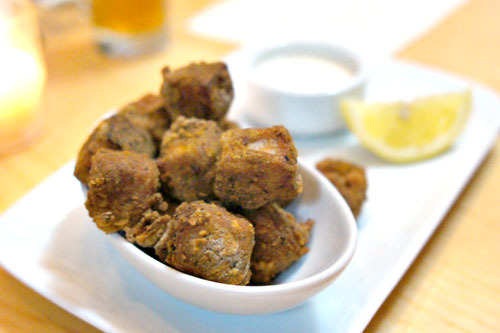 It was sort of a kindred spirit to Ludo's actually, with its chicken cracklin' and all. The organ meat itself was flawless, mild at first, but with a growing liver-y relish countervailed by hints of spicy and herbal elements, both of which did a wonderful job in moderating the substantial weight of the offal. 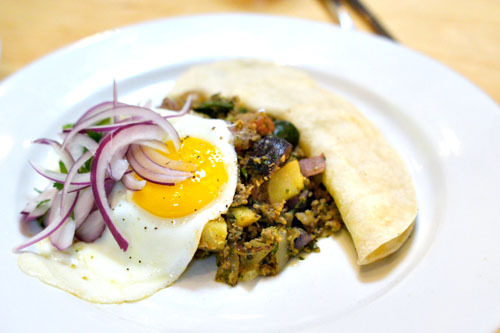 As for the crackling, it added a superb savory flair to the dish, and also mixed things up texturally. Bone marrow was also one of the strongest preparations that I've had. The marrow, not surprisingly, was certainly deserving of the descriptor unctuous. 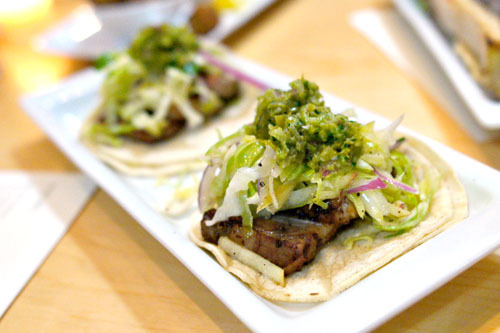 Taken alone, it was intense, but mix the trembling marrow with the salad of radish, caper, and cilantro, place it in one of the included corn tortillas, and you have a bite of rich, fatty goodness tempered by an array of light, bright, acidic flavors. Perfect. The Chef cures and smokes his own bacon in-house, and here, cubes of the stuff are deep fried to perfection. Loaded with tons of porcine goodness, the pork belly showed off a deft mix of lean and fat, and was beautifully complemented by its crisp fried casing. The bacon was certainly delicious alone, but the paired maple cream threw a sugary component into the fray that worked too, and a sprinkle of lemon juice was on point as well. 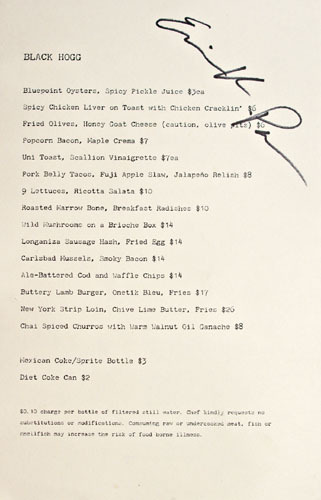 Park thus succeeds in making bacon even unhealthier than it already is, and the dish is quickly (and rightfully) becoming one of his signature items. But I'm stuck wondering: how has anyone not thought of this before?!? The tacos are also a popular item on the menu, and for good reason: they were probably the best non-traditional tacos that I'd ever had. Pork belly makes another appearance, and was spot on once again. The crux here, though, was that fantastic blend of apple, onion, and cabbage, which did a wonderful job in moderating the heft of the meat (adding a pleasing crunch in the process to boot). The jalapeño, meanwhile, contributed an overarching, lingering heat to the tacos that just tied everything together perfectly. A must try. Up next was another beer from Belgium's De Proefbrouwerij. 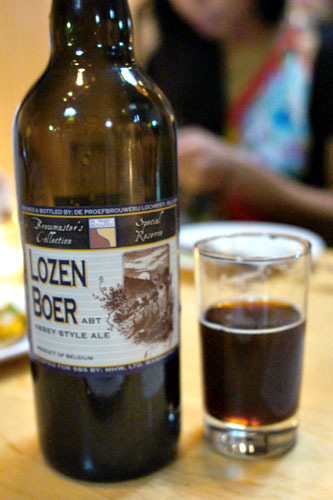 The Lozen Boer was done in the quadrupel style, and thus conveyed a tasty backbone of dark fruit maltiness, balanced by a citrus-y tartness and a nice yeasty profile as well. 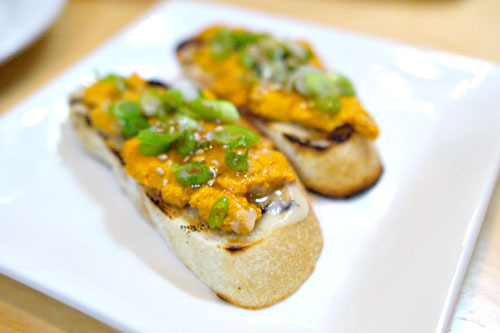 The uni toast was another table favorite, with the fresh, sweet, briny essence of the urchin proudly on display. However, what made this special was the scallion and sesame, which provided a beautiful point of levity to the dish that paired with the uni without fault. We even ordered another round of these. A mélange of mushrooms showed off a wonderfully woody, earthy relish that really conveyed the pure, unmitigated essence of the fungi. At the same time, the fluffy, subtly saccharine brioche did an admirable job of offsetting their considerable heft. 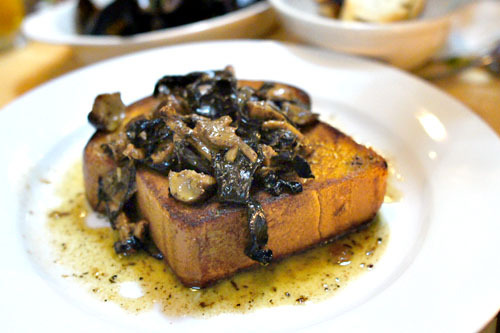 My only concern here was that, due to the sheer thickness of the brioche, the bread-to-shroom ratio was a bit off (in that I wanted more mushrooms). Park made a strong point with his mussels as well. They were cooked flawlessly, plump and succulent in bite, and great in the dish's rich, buttery broth. 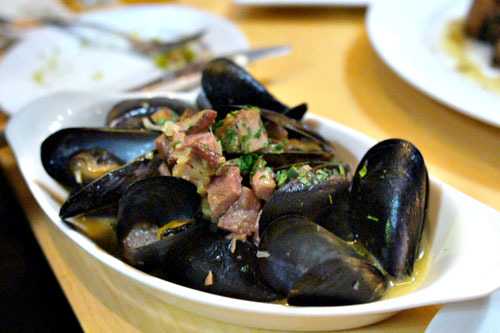 What I really appreciated though was the use of bacon, which added a great kick of salt to pair with the inherent salinity of the mussels. 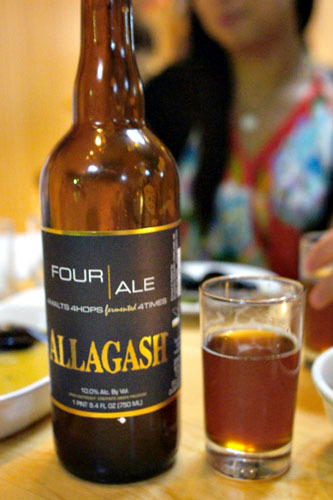 Beer #3 was also a quad, the Allagash Four, named so because the beer is made from a blend of four malts, four hops, and four sugars, then fermented four times with four different yeast strains. The result was pretty remarkable, with a raisin-y, fruit-laden core and malty sweetness countered by a touch of hoppiness and a tinge of spice. Very smooth. Black Hogg debuted with Shigokus (which I first had at Ohshima) on the menu, so I was a bit disappointed to see them replaced by Blue Points. 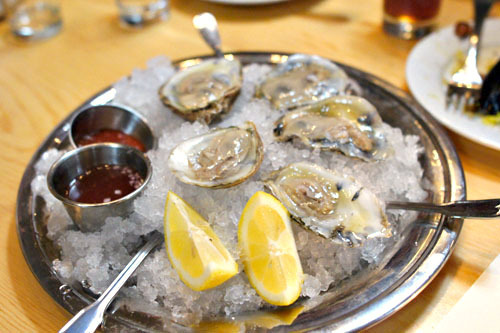 Nevertheless, the oysters were still top notch: so fresh, so clean, with a crisp salinity and lingering minerality. The paired spicy habanero pickle juice was something else, too, and a worthy replacement for mignonette. I'm a sucker for sausage and fried egg, so this was obviously a must try. Not surprisingly, it was delectable, showing off deep, heady, aromatic flavors from the longaniza, gorgeously set off by pinpoints of spice and the bracing astringency of red onion. Potato, meanwhile, served to moderate the dish, and I loved the runny egg, which added an enveloping, integrating richness to the course. 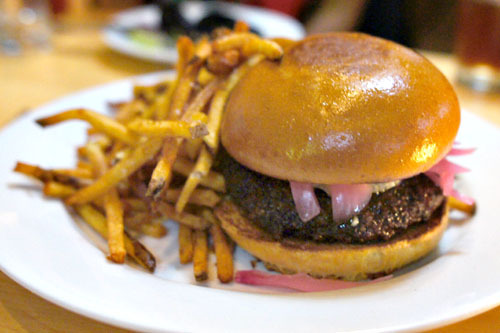 Though we were getting quite full at this point, we just had to try Black Hogg's signature lamburger, replete with Onetik Bleu des Basques (which Park discovered at the nearby CheeseStore of Silver Lake) and pickled onions, all on a toasted brioche bun. It was great to see lamb utilized here, and it was delish: plenty juicy, with a profoundly savory smack and uncompromising richness, a result of butter being blended right into the meat I'm sure. 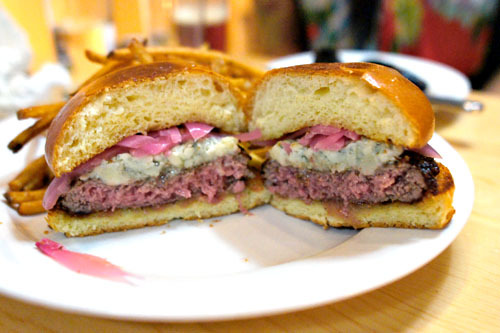 The flavors of the patty transitioned well to the salty, pungent taste of the sheep's milk blue, while the housemade pickled red onions contributed a great crunch and counterbalancing acidity to the burger. The included French fries were lovely as well. I will warn, however, that you probably shouldn't order this if you're not a fan of blue cheese; perhaps Park should offer a Lamb Chopper option--ha! 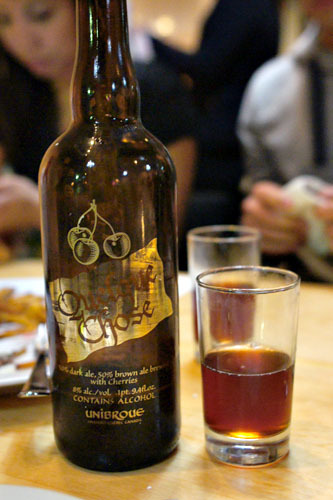 We ended with a "dessert" beer, the Unibroue Quelque Chose from Quebec, a blend of dark ale and cherry-infused brown ale. I found this to be pretty awesome, with an abundance of cherry tartness and just the right amount of sweetness, all accented by spicy, almost medicinal notes. To me, it was slightly reminiscent of cherry-flavored cough syrup, and one of my dining companions even likened it to a "fancy Dr. Pepper!" Black Hogg's sole dessert comprised a plate of churros, apparently inspired by a recipe from one of Chef Park's Mexican cooks. They were wonderful, hot and crispy on the outside, yet with fluffy, creamy interiors and a boatload of sugary, spicy flavors that I found immensely satisfying. 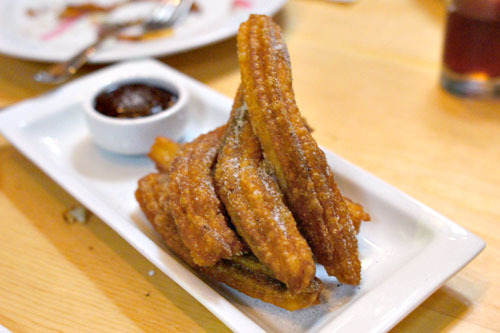 The paired dipping sauce added further facets of sweetness to the dish, but the churros easily stood alone. 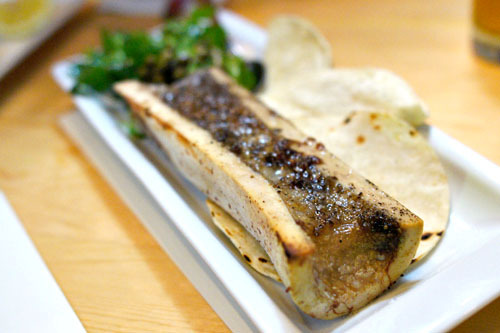 We left Black Hogg duly impressed by Park's meat-centric, unadulterated, old school-meets-New World menu. The cooking here is straightforward, but at the same time, bold and hearty and lusty, with big flavors and winning combinations. The Chef's palate shows a certain finesse, and I appreciate his use of acid, spice, and texture in the food. He really is doing some great things here at the moment, and it looks like Park is well on his way to making a name for himself. Kevin--when are you going to start drinking more beers from San Diego! You've literally got the Napa Valley of beer 100 miles away from you. . .
Vinh: You know, I was thinking the exact same thing regarding affordability. We left full at something like $27pp sans tip. Marian: See aren't you glad you decided to come? Order the salad on your next visit; I'm curious!